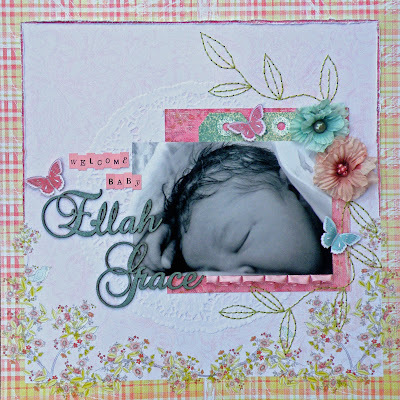 I used papers from the Prima Sparkling Spring Collection and the matching Whispers flowers. I added some handstitching, a paper doiley and luggage tags as well as some Maya Road trim. The gorgeous custom cut chipboard title was made for me by the lovely Terri from Meant to Be. 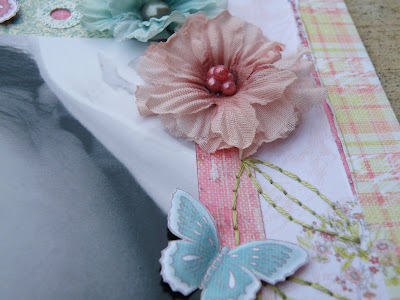 A close-up of the chipboard that I coloured with Smooch Spritz. A close-up of the handstiching, flowers and handcut butterflies. Love Love Love!!!! Loved having a cuddle of your gorgeous girl as well!! !